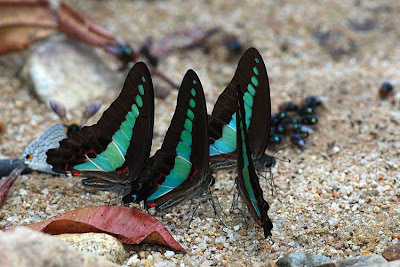 The Common Bluebottle is a relatively common species that can be found in the forested areas of Singapore's nature reserves. It is fond of flying rapidly up and down open tracks in the nature reserves, almost reminescent of fast cars zooming along Singapore's expressways. As its preferred caterpillar host plant, Cinnamomum iners is commonly cultivated as a roadside tree along many of Singapore's streetscapes, the species has also been brought out into urban parks and gardens. 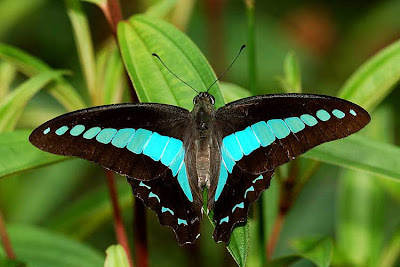 The species has a bluish-green macular band which runs from the apex of the forewing to the inner margin of the hindwing on both the upper and underside of the butterfly's wings. 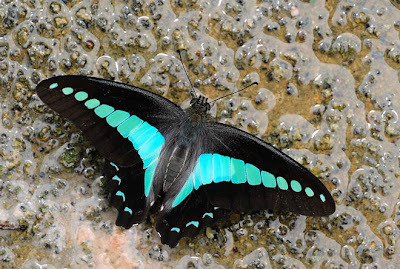 The hindwing has a series of blue submarginal spots on the hindwing on the upperside, and an additional red spotting on the underside of the hindwing. There is a red spot near the base of the hindwing on the underside as well. The males of this species can often be found feeding on roadside seepages or urine-tainted sand in the company of other Graphiums species. 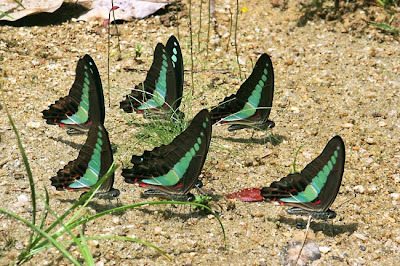 Occasionally, more than eight butterflies can be found congregated on one spot, jostling for the best position to imbibe the dissolved nutrients and minerals from the source of liquid food. In flight, one normally catches a glimpse of its blue wings. Females are rarer, but often encountered when she tries to oviposit in areas where the host plants grow in abundance, or when feeding on flowering plants. 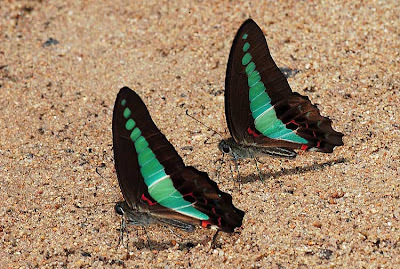 In some countries, this species is referred to as the Blue Triangle. 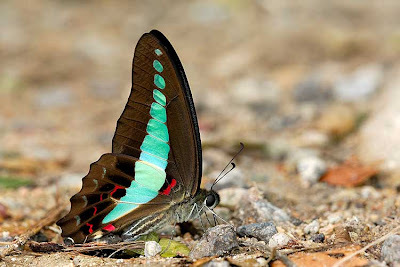 Males and females are similar in appearance, except for the scent fold on the hindwing of the male. The wingspan of the Common Bluebottle is typically between 85-90mm. An interesting observation of this species is that after a long session of puddling, the butterfly often flies off to a nearby perch and then stretches its wings out, as if to sunbathe.